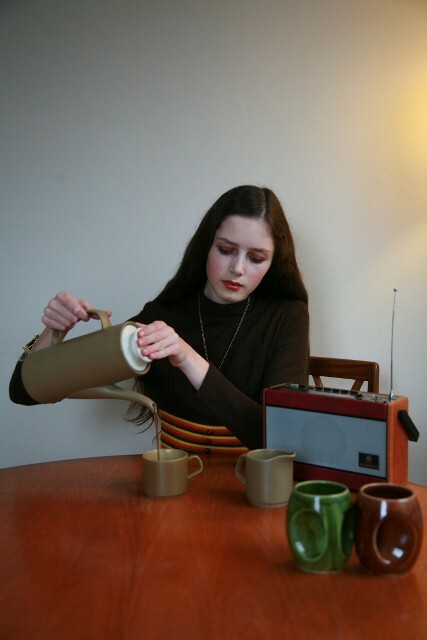 I originally called my blog 'Clothes, Cameras and Coffee' merely on a whim when I started it in June 2009. However, little did I know then that my fledgling love of clothes and coffee would turn into a full blown obsession! Now I realise that the first two references in my blog title are regularly acknowledged, while the 'coffee' element is somewhat left out. However, this post should change the balance a little! 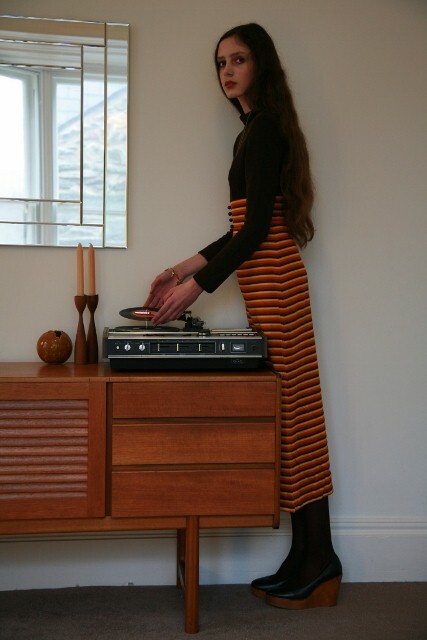 The inspiration behind this outfit was the idea of a lazy seventies morning - complete with breakfast and plenty of vinyl records. And of course it started with an outlandish dress that my mum bought a year ago from our favourite local market stall. On a hanger it looks like some hideous hybrid of beach towel and fire tinder (I was almost scared to brush my hair, lest a static spark set the incredibly flammable fabric alight!) However, when I put it on I felt much more elegant than anticipated. As I have mentioned before, the seventies is not a decade I am naturally drawn to - I prefer the New Look of the fifties, or the youthful spirit of the sixties. However, I thought now would be a perfect time to showcase the dress, as the the next London Fashion Week (which I will be attending, if I actually manage to get into any shows!) is mere days away. I really enjoyed the theatricality of this shoot. It was a fantastic excuse to pull out all the seventies crockery that my mum has found in various charity shops and on ebay! There is something about setting up a photographic scene that feels like putting together a theatre set - choosing the appropriate props. And for matching accessories, I added some charity shopped faith wedges, a pair of chocolate brown tights and a necklace that belongs to my mum. As a final point, I just wanted to thank AvaPilar who commented on my last post who suggested looking up some of Kate Bush's music videos. Having now done so, I feel the same way about her videos as I do about Tim Walker's photography - stunning in their variety and endlessly innovative ideas. For anyone who hasn't seen it, do look up 'Cloud Busting'. love this! very seventies inspired! The furniture and outfit combined are just so seventies Roz! The skirt is so vibrant so I like the way you've toned down the rest of the outfit with more muted shades. I also completely agree about how trends are already over before they hit the shops - I suppose that's why I think "why bother?" it's so much less stressful if I do my own thing! I suppose that is why vintage is an escape route for me. I love this! Those wedges are to die for! I have to agree with you about the time dissonance in fashion - by the time you can actually wear the clothes (be it thanks to season or highstreet availability) they're already old news! Sometimes I think coverage should be a bit more staggered, to keep the excitement going. I love the wide leg jean look from the runways for the 70's look. But, at the same time I never stopped wearing mine. It does feel like it all goes a little too fast sometimes, we don't even get to savor it. 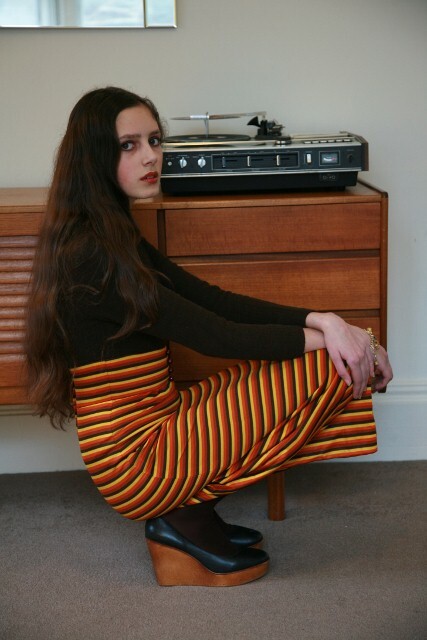 I adore the vibrancy of the skirt and most importantly I am seduced by the story behind the pictures - I find them they have a mysterious quality. Your makeup is flawless. Lovely photos, Roz! The seventies look isn't one that I especially go for, but my mother has kindly passed on some of her dresses from the decade and they are really beautiful. Love this, I did a post on the 70's not long ago too! Also.....this is the first indoor shoot of yours am seeing on the blog.....& it's as awesome as your outdoor ones!!! Fashion is dead but style lives on, beautiful photos! Looking back in time the 70s was the worst fashion ever. But somebody out there love it, so it is recurrent every year. I love the glamour, and magnificent dresses of the 40s, and the wild and free 80s. You look fantastic in your 70s coffee morning outfit. Love your first photo the best. You look like a perfect mannequin in these photos. Stunning! I'm always late commenting on your posts because I leave them to read last in my reader, knowing I will want to spend time drooling over the photos. Roz, your posts are always so thoughtful and interesting. A pleasure to read! I love how you put so much thought into what you write and the setting of your photograph. I definitely echo your 70s sentiments. You inspire me to put more effort into writing my blog posts rather than rambling on about the weather and pretty frivolities! The '70's are much maligned but they are the decade of natural materials and organic design and when done right still feel modern. It's just the decade also mass-produced cheap versions of the designs and so we think of it with distaste. You've really captured the '70's feels without looking like a cliche version of 1973. I've just watched the BBC show, Look Around You. Have you seen it? Perfect pistache of the '70's vibe. Peace. Love this post! I adore your outfit and I love how you did the entire 70s look to your photos! I really enjoyed this post. Lovely thoughts. Your hair totally matches this look! The props you used are awesome, too. i love it! not a lot of people could pull off horizontal stripes, especially in the form of a long skirt, but you pull it off marvelously! 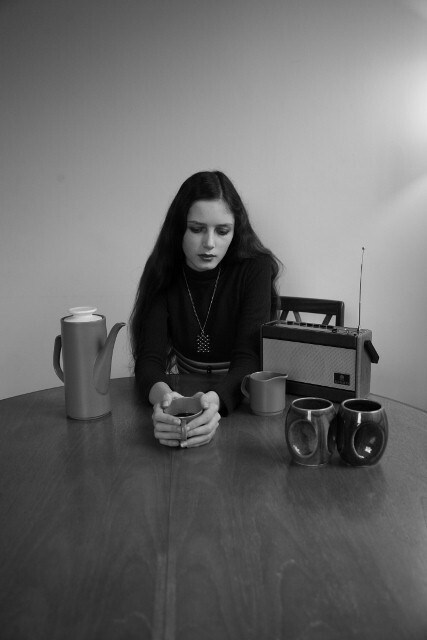 i think your reference in seventy with the moody photo are really perfect. there is this nostalgic feeling in your photos that i like very much. 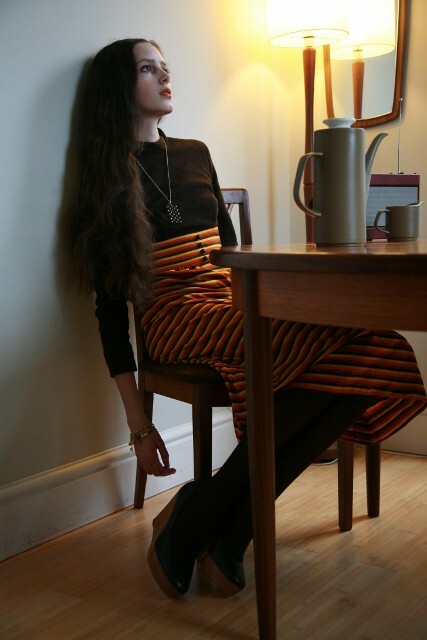 love the skirt, such psychedelic colours, I love the vibrancy of it against the deep brown tights. Amazing photos, and I agree with what you say about setting things up for the photos, just like a theatre! I love this outfit, and the inspiration to it is fantastic! join my giveaway, u can win a beautiful bag! I love that skirt and the whole mood of the photoshoot! It was great to meet you today and your mum at Sommerset House. I loved your outfit. you look so beautiful in these photos, m'dear! love that long skirt on you. kate bush has been one of my favorite artistis for several years now---her music, lyrics, music videos, and personal style are dripping with beauty, originality, and creativity! Hi Roz, I hope you're well. This shoot is certainly a new one for you, I love the 70's theme. Where are the side drawers from? They remind me of a some by a Swedish design house but knowing you and your mothers excellent eye for vintage I'm sure it's a original piece you found in an antique store. Did I see you today at Osmans studio with your mother collecting tickets for his show? I'm sure it was you and would have come over and said hello but I was super busy working on the running order for the show. I'm now officially working for a stylist s was assisting her on the show. I hope your trip to LFW is proving to be an interesting one for you. Just stumbled across your blog and I love it! This shoot is just great. 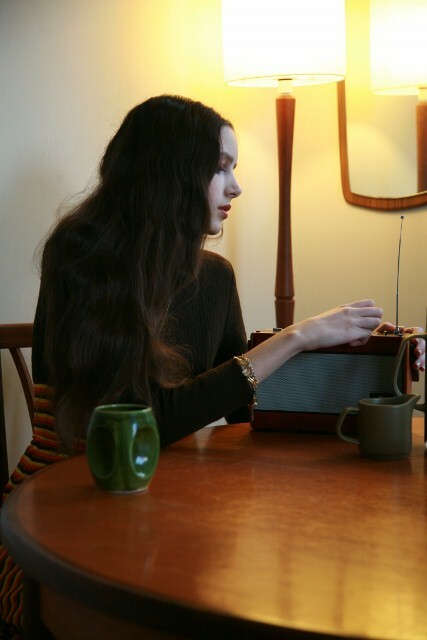 Love your hair and the 70s inspiration. cool! you have legs like me!